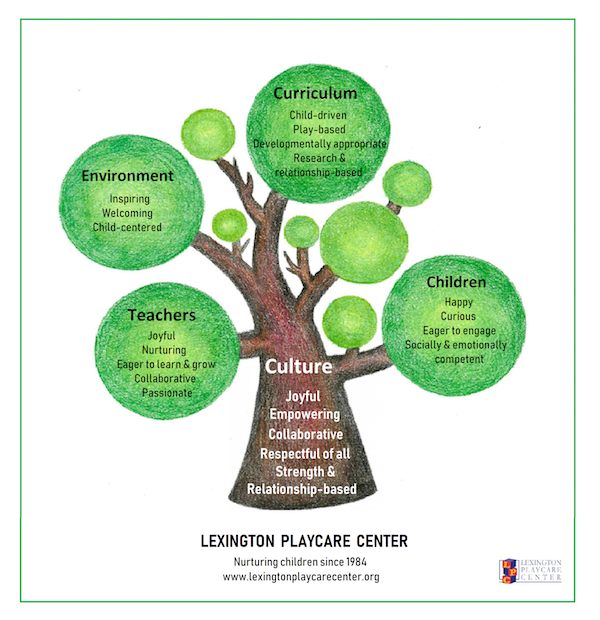 In October of 1984 Lexington Playcare Center (LPC) opened its doors and became the second full day child center in Lexington. Back then we were licensed for 24 children and even though each slot was full from day one, we were on a very tight shoestring budget. Inside we had tables, chairs and a few toys. Outside we had a fenced-in grassy area. We barely had paper to color on! But we did have (and still have!) devoted teachers and involved parents. Thanks to those amazing people, LPC became a happy, creative, successful school right from the start! In 1985 we doubled our enrollment and added toys, art supplies, a climbing structure, and we absolutely gave up on grass! Now all these years later, I think about how children grow older and leave us to enter Kindergarten. And sometimes a teacher leaves us to have a baby or move. But as faces change, the core of LPC stays the same. We have fun here. It’s a warm, happy, inclusive environment. Some days I might say it’s downright magical! Our mission is to help children become good friends, proficient problem solvers, creative risk takers, and self-governing, accepting classmates. We want them to be as self-sufficient and independent as they can be based on their age and development. We respect parents and welcome them as partners and provide them with consistent and daily communication. Our community works hard to maintain a democratic, welcoming, and inclusive environment, which properly balances education and childcare. If you consistently see high staff morale, happy, curious children, involved and informed parents, then we have reached our goals! Our Natural Playground was installed in 2012 after two years of planning! What is a natural playground? 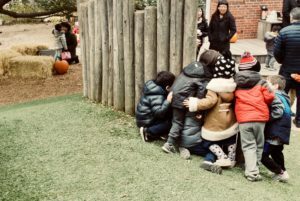 To help people understand this new concept we explain it this way – It is an environment designed to allow children to have organic experiences much like they would if they were lucky enough to have woods in their backyard. 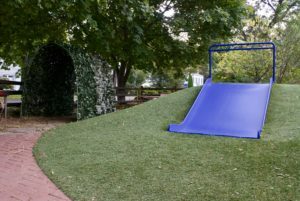 This type of design represents a major shift from manufactured play equipment to a design that incorporates plants, trees, and other natural elements such as logs, rocks and sand. Our playground is a magical place where children have an opportunity to interact in an organic way with our natural world. 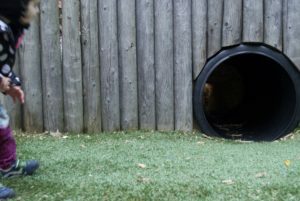 When you visit you will see a hill with a slide and a tunnel, a water pump, apple trees, blueberry and butterfly bushes, a four surface trike path, a fallen log, movable logs, a hobbit house, and so much more. It is a pleasure to watch our children play in such a wholesome, organic environment and manner!